Many people have bought a PUR or Brita faucet filter and had bad results, so they never buy another filter again. There are many other good brands out there and DuPont has been known to be one of the best brands in whole house filtration systems. As well as under sink faucet filtration systems. When it comes to faucet water filters, DuPont seems to have the same issues as many other brands, which is leaking problems. It would seem that no company can design a filter that won’t leak!? The life of the filter is long with 200 gallons of water before having to be replaced or about 6 months. Whereas most PUR filters require you to replace them after 2-3 months. The water taste is crisp and clean and many say it tastes better than the other name brand filters. The new PUR 3-stage filters use charcoal and give off a charcoaly flavor to the water. 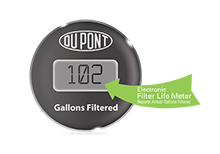 The DuPont filter uses a Microban Antimicrobial water filter, which is designed to prevent “microbial life” from getting into your water. DuPont uses Microban Antimicrobial filtration which is similar to there design for the larger home filtration filters. 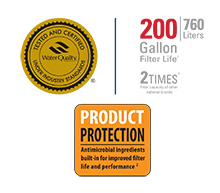 It stops the growth of bacteria and is rated by the NSF/ANSI standard 53 to remove lead, atrazine, lindane, as well as cysts, bacteria and viruses. This Microban material gives the water a distinctly unique taste and does a good job of removing many harmful bacteria and organisms. This style of filter also has the added benefit of increasing the water flow. The filter life is good at 200 gallons nearly double the life of other filters and the price is reasonable for the filters. The sceen tells you how many gallons are filtered and the batter life plus tells you the flush cycle. Easy to use knob on the side allows you to have filtered or unfiltered water. There are little grips on it so you don’t slip off the knob if your hands are wet. WQA certified to reduce asbestos, lead, mercury, turbidity, microbial cysts, cryptosporidium, giardia and particulates Class 1. Filters 200 gallons of water before needing to replace the filter. 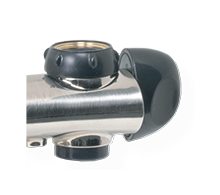 The DuPont WFFM350XCH comes in a variety of different styles including chrome, white and brushed nickle. Easy to install replacement filters with a life of around 200 gallons. The DuPont uses an interesting filtration method that no other filter on the market uses. This filters 200 gallons of of water and has a LCD meter with black letters on blue background showing the number of gallons that have been filtered for a few seconds. Overall most people are happy with this unit. The biggest complaint is that after several months it begins to leak and the display may malfunction. From my experience almost every faucet water filter has the potential for leaks if the water pressure is not properly maintained. The digital sensor burning out is another problem for most faucets. Either the bad can die or the unit gets water inside and the circuit board breaks. To be honest I like the unique filtration method that DuPont uses. The design is stylish and has a nice looking readout display screen. This is one of the more high end models, so you need to tread it as such. Don’t let the water flow out too quickly from the faucet and you should be fine. Overall I say this is a 8/10. Losing 2 point for the fact that many people have leak and sensor malfunctions.